April 9, 10 & 11, 1964. Witchcraft, apparently, has a lighter side, Bell, Book and Candle by John van Druten, produced by the Wick Theatre Company at the Barn Theatre, Southwick, last week-end, turned out to be a first rate comedy. With the happy combination of a polished, well-written play and a small but highly versatile cast, this production just could not go wrong. It can be chalked up as a winner by the company. There were some improbable characters in the Knightsbridge flat so admirably depicted in stage manager John Perrett’s set – a couple of ‘upper crust’ witches and the warlock brother of the younger, all dabblers in the supernatural with varying degrees of success. One just could not believe in them for a moment, but they were great fun none the less. The play concerned itself with the efforts of a most attractive young witch, Gillian Holroyd, to steal the affections of a young man, Anthony Henderson, by casting a spell over him just when he was about to get engaged to another girl. It worked all right, with spectacular results, although Gillian let herself in for some heartache in the process and very nearly ‘lost her man’ when the spell was broken. Sheelagh O’Farrell played Gillian with fine verve and really sank herself into the requirements of this pivotal rôle. Whatever the mood of the moment she was more then equal to the occasion. Her sister, Clodagh, co-producer with Ralph Dawes, did well to entrust her with the part. Barrie Bowen, as Anthony, also fully measured up to requirements, divertingly paying the young man so sure of him-self until entangled with forces beyond his control. As Aunt Queenie, the ‘old hand’ at witchcraft, Betty Elliott contributed appreciably to the frolic, and the cast was ably completed by Peter Power as Sydney Redlitch, a rather seedy writer on the Black At, and a promising newcomer, Colin Lydon, as Nicky, the warlock – not forgetting Pyewacket, the loaned Siamese cat, who never let the side down while on stage. Assisting backstage were, Frances Thorne, Paul Carpenter, Terry Mase, Frank Hurrell, Morfydd Bowen, Margaret Perrett, Susan Hayter, Maureen Payne and Jackie Mase. 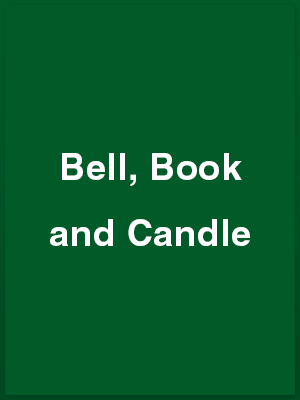 JOHN VAN DRUTEN’S comedy of witchcraft, “Bell, Book and Candle,” was staged by the Wick Theatre Company at the Barn Theatre, Southwick, last week, with the part of the very charming and efficient witch, Gillian Holroyd, very well played by Sheelagh O’Farrell. Anthony Henderson, bewitched out of his engagement to another girl and into the arms of Gillian, was played by Barrie Bowen. The two players form a very good comedy team indeed. Aunt Queenie, a lesser witch, somewhat demonstrative and ill-advised, gave well-taken opportunities to Betty Elliott. Gillian’s younger brother Nicky, himself no mean warlock, was creditably played by Colin Lydon, with Peter Power as Sydney Redlitch, the author interested in the occult who gets himself rather involved with the real thing. Finally there was an excellent performance by Fred Baskeville as Gillian’s ‘familiar’, Pyewacket. Fed Baskerville is a handsome and intelligent Siamese cat, loaned to the players by Peggy Milford. He did her proud. This play would lose much of its fun if the various tricks did not work properly, but stage manager John Perrett, with assistance of Frances Thorne, had all the self-opening doors and cupboards and the self-extinguishing lights functioning with great efficiency.